Is it possible? Does gluten-free bar-b-que exist? I've always wondered. I've always been wary. Sauces. You never know what people put in their sauces. You never, ever, ever know what restaurants put in their sauces. And bar-b-que sauce is no exception. When my cousin invited me out for dinner at a bar-b-que restaurant, I was skeptical. Hesitant. Cautious. But just a moment's worth of research on the internet put my fears to rest. This bar-b-que looked safe. 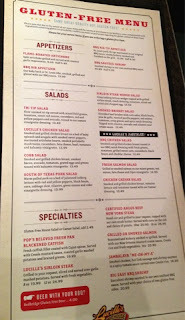 They even have a full-fledged, gluten-free menu! With gluten-free appetizers! With gluten-free salads! With gluten-free BBQ! With gluten-free sides! With gluten-free sandwiches and burgers! There was no way I was going to turn down this invitation. Bar-q-que! For the gluten intolerant! Finally! Never mind that we were in LA, and the traffic was typical, lousy, LA traffic and I had to drive forty-five minutes, each way, in it in order to get my gluten-free bar-b-que. Yeah, never mind. It was worth all that traffic-laden freeway time! While waiting at our table, I asked the waitress if they had any gluten-free beer. Redbridge? Hmmm.... That's a sorghum-based gluten-free beer. I've heard terrible things about sorghum beers. I didn't want to waste a beverage on something I was skeptical about, so I opted for something else gluten-free. But I guess I will have to brace myself and try Redbridge one day. This was not that day. 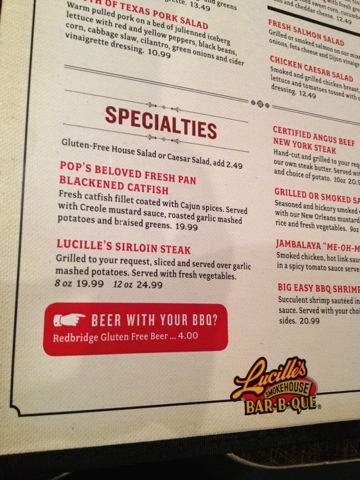 Bonus points to Lucille's for offering a gluten-free beer, though! 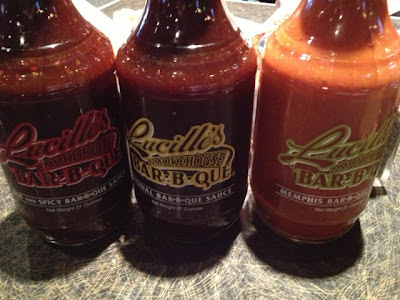 They also offer their signature bar-b-que sauces for sale. So many choices! And these are gluten-free too! Time to scour the menu for something to eat. I was blissfully swamped by the plethora of gluten-free menu choices. So many gluten-free things to chose from! I had a hard time narrowing it down. I logically reasoned that if I was in a bar-b-que joint with a full-fledged gluten-free menu, I probably shouldn't waste the opportunity and get a ... salad. Crime! That would be a crime! No. I had to get bar-b-que! Now... would it be baby back ribs, beef ribs, BBQ chicken, beef brisket, or BBQ tri tip? Oh my! Who would have anticipated such choices, all gluten-free? Dang. I had to pick. But which? There was no way I could try them all. I stalled. I hemmed. I hawed. I couldn't pick just one. Finally, I chose the beef ribs. This picture does not do justice to size of this plate! It was enormous. I could have fed a small African village with this much food! What was I thinking? Three huge beef ribs. And two gluten-free sides: the honey roasted peanut slaw and fresh vegetables. I couldn't imagine finishing all this food. Not within the next week. And then I bit into a rib. Oh. My. Goodness. Wow. Superb! It was so tasty and delicious! I made a justifiable mess of myself chowing down on those ribs. Bibs needed! Handi-wipes required! And my cousin had the highest possible praise for the slaw. He said, "It's the only restaurant slaw that comes close to Grandma's." Yep, he's right. Close. Not quite as good, but close. And far better than any other slaw I've encountered at any restaurant. Everything was so good, I couldn't stop eating. And then something amazing happened. I finished everything on my plate. Unbelievable. I seriously never thought I would come close to finishing it all. But I did. Maybe the best part of Lucille's is that there are many locations in Southern California, one in Northern California, two in Nevada, and one in Arizona. 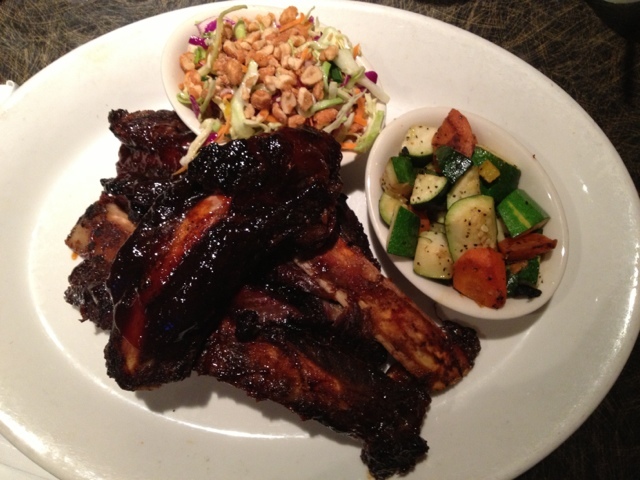 If you are headed to the southwest, you must find a Lucille's! 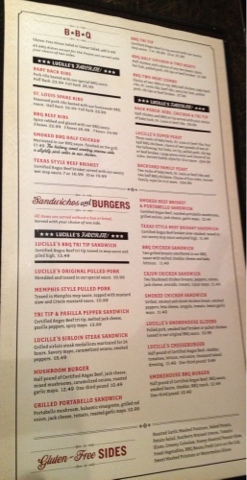 Okay, okay, that is not the best part of Lucille's, but it is a good thing! 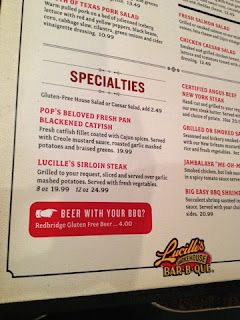 The best part of Lucille's is the extensive and delicious gluten-free offerings! Here, you can have bar-b-que! Gluten-free bar-b-que! Bar-b-que for everyone! Most excellent!